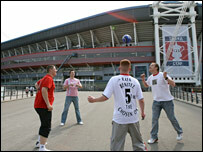 Knock-out club football found a home at the Millennium Stadium in 2001 after work started on building the new Wembley Stadium. Sunday's Johnstone's Paint Trophy thriller between Bristol Rovers and Doncaster - Doncaster winning 3-2 in extra time - served as a fitting last chapter to six years and 46 finals of footballing drama in Cardiff. The Football Association and the Football League have already confirmed that this season's FA Cup and divisional play-offs will be held in north London. When Wales' 74,500-capacity national stadium, built for the 1999 rugby union World Cup, was given the role of Wembley stand-in, it was only meant to be for three years. What are your best Millennium moments? But delays and overruns on the new Wembley development have meant that the cream of knock-out football has stayed in Cardiff for twice that length of time. Robbie Fowler had the honour of scoring the first goal at the stadium in a final when he helped Liverpool to victory over Birmingham City in the then Worthington Cup final, which was decided on penalties. Early misgivings ranged from the quality of the pitch - its pallet system prone to cutting up - to traditionalists fretting over whether the FA Cup should be played outside England for the first time in its history. There was even the curse of the south changing room to be overcome, which led to the first 12 major cup and play-off finals being won by the team using the north end of the ground. Eventually a combination of feng shui and Stoke City, in the 2002 Division Two play-off final, ended the jinx. Visiting fans have largely come to love the Millennium Stadium, appreciating not only the venue itself but also its proximity to major transport links and the best of Cardiff's pubs, bars and eateries. But the best entertainment always took place on the pitch, so here BBC Sport looks back at some of the most memorable matches from six years of Millennium magic. The FA Cup final arrived in Cardiff with a bang as Michael Owen whisked the trophy out from under Arsenal's nose. The Gunners had controlled the match for long spells and Freddie Ljungberg's 70th-minute strike seemed destined to give Arsene Wenger's side the win. But Owen struck twice in the last eight minutes to ensure the FA Cup went north to Anfield. This season proved a bumper one for the Football League's finale, with Bournemouth setting the tone against Lincoln in the then Division Three final on the Saturday. A physically imposing and direct Lincoln side had been tipped to sweep the Cherries aside but found themselves on the wrong end of a 5-2 thumping as Bournemouth turned on the style. Wade Elliott tormented the Imps with his forays down the flank and, fittingly, Bournemouth captain Carl Fletcher, the Wales midfielder, popped up with two of his side's goals. The Division Two play-off final the following day had a special resonance because it involved local side Cardiff City, who saw off Queens Park Rangers 1-0 in extra time. QPR's defensive pair of Danny Shittu and Clark Carlisle were outstanding but the Londoners could not take advantage up the other end of the park. A nerve-wracking match was finally settled in the 114th minute as substitute striker Andy Campbell's lob sent the Bluebirds back into the second tier after an 18-year absence. Wolves had been out of the top flight even longer, 19 years, but Dave Jones' side claimed a Premiership place in style with a 3-0 win over Sheffield United. Both sides set out with the intent to attack but the Blades were simply swept aside by the men in gold during a first-half blitz on the Bank Holiday Monday. Mark Kennedy set things rolling with a stunning strike before Nathan Blake and Kenny Miller struck to kill off the match before half-time. Both FA Cup semi-finals as well as the final were played in Cardiff this season but it was the Football League Trophy that produced one of the best stories. North Wales side Wrexham were deep in the financial trouble that would eventually lead them into administration and fall down a league. But for this afternoon the Dragons were in their pomp as they invaded Cardiff, beating Southend 2-0 in extra time thanks to goals from Juan Ugarte and Darren Ferguson. 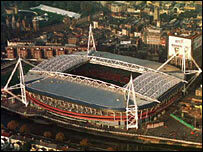 The last FA Cup match to be played in the Millennium Stadium proved a fitting send-off in one of the classic finals. West Ham took the lead through Jamie Carragher's own goal and Dean Ashton's close-range strike before Djibril Cisse and Steven Gerrard drew Liverpool level. Paul Konchesky's cross-shot seemed to have won it for the Hammers but Gerrard produced a brilliant last-minute strike to force extra-time, the Reds going on to win on penalties after a breathless period of additional action. Swansea were the last of the three Welsh clubs in the Football League to appear at the Millennium Stadium - but became the only one to lose. Paul Hayes gave Barnsley an early lead but the Swans, roared on by a huge travelling support, took the lead through Rory Fallon and Andy Robinson. Any thoughts the Swans had that they were destined to win this one were dispelled by Daniel Nardiello's free-kick to send the match into extra time, with the Tykes holding their nerve in the penalty shoot-out. Cardiff was treated to an absorbing last major final between London rivals, who were full of flair, running and endeavour. Theo Walcott opened the scoring for the Gunners but two strikes from Didier Drogba enabled Chelsea to come from behind to clinch it. But the final moments were marred by a brawl between the two rival sets of players that ended with Mikel Jon Obi, Kolo Toure and Emmanuel Adebayor being sent off.